The Subaru Forester 2.0XT and 2.0i-L models are now available in the Philippines. * Superior driving performace and ride quality powered by the new-generartion Boxer engine combined with Lineartronic transmission. The new fourth-generation Forester 2.0XT features Subaru’s Horizontally-Opposed Direct Injection Turbo (DIT) engine. Combined with the brand’s high-torque, responsive Linerartronic transmission, the Boxer engine ensures that it delivers a more dynamic and enjoyable driving experience with increased mid-to-low range torque and smoother acceleration. Environmentally friendly technologies are also designed to reduce friction and improve combustion efficiency, achieving superior fuel efficiency. At the core of the Forester is Subaru’s unique Symmetrical All-Wheel Drive technology (AWD) that provides a sense of stability and allows for a quick response to challenging road conditions. Further enhancing the AWD’s ability is a newly developed X-mode control system that is designed for any driver to easily navigate on tough roads, handle slippery surfaces or steep hills with just one switch. 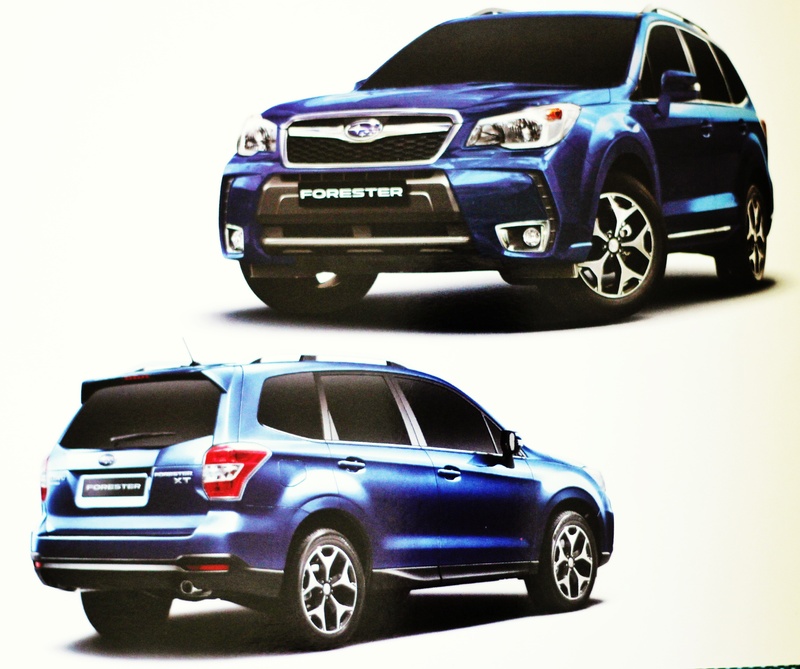 In another move to further enhance its drivability, the new Forester now comes with SI-DRIVE. The Forester 2.0XT variant provides the driver the option of “Intelligent”, “Sports” and “S# (Sports Sharp)” modes, each to promote both driving pleasure and fuel efficiency for the driver. And superior crash safety performance has been achieved with the Forester, thanks to the specially designed body made with high tensile steel that reduce the vehicle’s weight while retaining high rigidity. From a design and comfort viewpoint, the new Forester is larger and roomier than its predecessors with a redesigned cabin. A wide field of view for all seats and spacious visibility for stress-free driving have also been achieved in the repackaging. Drivers will also get more convenience on-the-go with expanded cargo space and a new power-lift tailgate operated by push-button, a first for Subaru. “The all-new Forester reinforces its reputation of being an icon of dependability and versatility. The Forester’s outstanding perfomance and practicalilty is backed by its improved fuel efficiency, safety and utility features with a premium level of comfort,” said Mr. Glenn Tan, Executive Director of Tan Chong International Limited (TCIL). 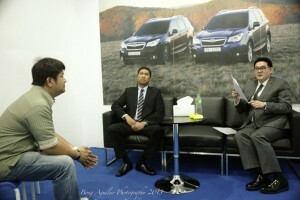 Mr. Glenn Tan being interviewed by yours truly. He is responsible for the company’s automotive distribution portfolio which comprises the Nissan, Subaru, Changan, Fuso and Foton brands across different parts of Asia. Mr. Tan is currently spearheading the group’s rapid regional business expansion, which has included the opening of new branches and dealerships in the region and plans for a total of 200 distribution outlets in the ten key countries by the end of 2012. Other business expansion plans include distribution of Changan and Foton vehicles in selected key markets in 2013. Tan Chong International (HKSE: 0693) is listed on the Stock Exchange of Hong Kong and is a major motor, property and distribution company with operations on Singapore, Cambodia, China, Hong Kong, Indonesia, Japan, Malaysia, Philippines, Taiwan, Thailand and Vietnam. Since its inception in 1957, the Group has grown its assets substatially through continuous expansion of its existing diversified business portfolio in manufacturing, distribution and retail. The all-new Forester is available for booking at all Subaru showrooms nationwide.